Workman Publishing Company, 9780761141686, 1008pp. The ultimate gift for the food lover. In the same way that 1,000 Places to See Before You Die reinvented the travel book, 1,000 Foods to Eat Before You Die is a joyous, informative, dazzling, mouthwatering life list of the world’s best food. The long-awaited new book in the phenomenal 1,000 . . . Before You Die series, it’s the marriage of an irresistible subject with the perfect writer, Mimi Sheraton—award-winning cookbook author, grande dame of food journalism, and former restaurant critic for The New York Times. 1,000 Foods fully delivers on the promise of its title, selecting from the best cuisines around the world (French, Italian, Chinese, of course, but also Senegalese, Lebanese, Mongolian, Peruvian, and many more)—the tastes, ingredients, dishes, and restaurants that every reader should experience and dream about, whether it’s dinner at Chicago’s Alinea or the perfect empanada. In more than 1,000 pages and over 550 full-color photographs, it celebrates haute and snack, comforting and exotic, hyper-local and the universally enjoyed: a Tuscan plate of Fritto Misto. Saffron Buns for breakfast in downtown Stockholm. Bird’s Nest Soup. A frozen Milky Way. Black truffles from Le Périgord. Mimi Sheraton is highly opinionated, and has a gift for supporting her recommendations with smart, sensuous descriptions—you can almost taste what she’s tasted. You’ll want to eat your way through the book (after searching first for what you have already tried, and comparing notes). Then, following the romance, the practical: where to taste the dish or find the ingredient, and where to go for the best recipes, websites included. Mimi Sheraton is a journalist, restaurant critic, lecturer, IACP and James Beard Award–winning cookbook author, and the woman about whom famed chef Jean-Georges Vongerichten declared: “Her knowledge knows no bounds, her glossary of flavors is ultimate. Her opinion is like gold.” The former restaurant critic of The New York Times, she’s also written for The New Yorker, Vogue, Vanity Fair, Food & Wine, Smithsonian, and more. In April 2016, the Culinary Institute of America honored her as a Legend of New York Dining. Ms. Sheraton lives in New York City. "Her voluminous guidebook is an alphabetical cornucopia of food types and sources..."
"From abalone to za’tar, Zingermans to Achatz, and lampascioni to lasagna, Mimi Sheraton has scoured the world—both cerebral and physical—to discover the most delicious and thoughtful comestibles. Her taste is intuitive, her curiosity insatiable, and the breadth of her knowledge, research, and experience is encyclopedic. A perfect book for expert and neophyte, it’s the definitive roadmap to gustatory revelations, wherever you are." "To this non-foodie, 1,000 Foods to Eat Before You Die was a revelation—perhaps the most useful travel guide on my shelf. I'm heading to Marrakesh for tagine right now." "Mimi Sheraton is a national treasure. 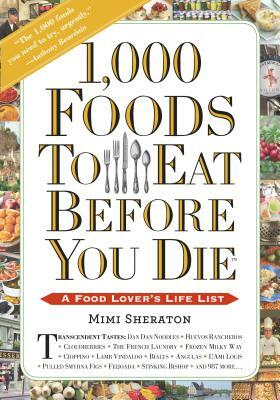 Her knowledge of food can't be beat—if anyone knows the 1,000 foods of a lifetime, it's Mimi."